Windsucking, or Cribbing, is a potentially fatal condition that can affect almost any horse. It is a debilitating habitual behavior leading to digestive problems, stomach ulceration and severe loss of condition. It can cost horse breeders, owners and trainers thousands & even hundreds of thousands of dollars. Barclay’s Anti-Cribbing collar offers a cure without the need for continual human intervention. 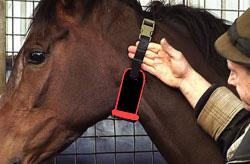 It contains a switch that is activated by the horse’s throat action just before windsucking. It delivers a mild static charge each time the horse attempts to windsuck. The charge is delivered by a piezo crystal switch similar to those found BBQ ignition systems and mosquito bite 'zappers' commercially available for human use. This will not harm the horse in any way and will deliver a gentle but effective reminder each time the horse attempts to windsuck. 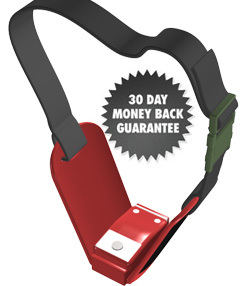 The Barclay Anti-Cribbing Collar is NOT a constriction type collar. Fitted correctly it does not interfere with breathing, eating or drinking. Barclay's Collar is available in 2 models. BC001 - Manufactured from UV resistant nylon. with UV resistant hinged side wings.